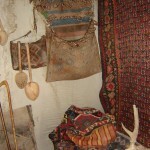 Historical-Architectural Reservation is situated in Gosh Village, 15 km to the east of Dilijan. 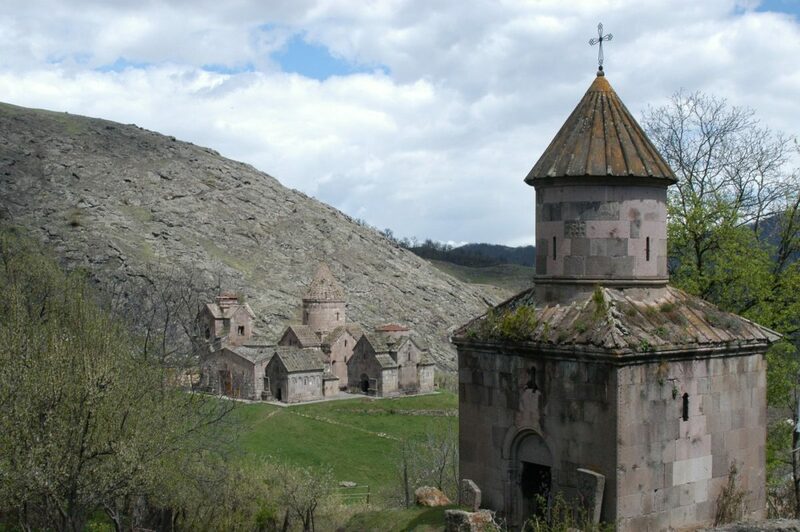 The reservation has been working since 1974 and since 2003 it has been the branch of the “Service for the Protection of Historical Environment and Cultural Museum-Reservations” SNCO of the Ministry of Culture of RA and includes the Monastic Complex of Goshavank (state index 10.23.14) involved in the state list of immovable monuments of history and culture of Tavush Province of RA. 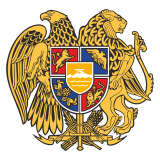 The list was approved by order-decision N 1929 (December 30 of 2004) of the Government of RA. 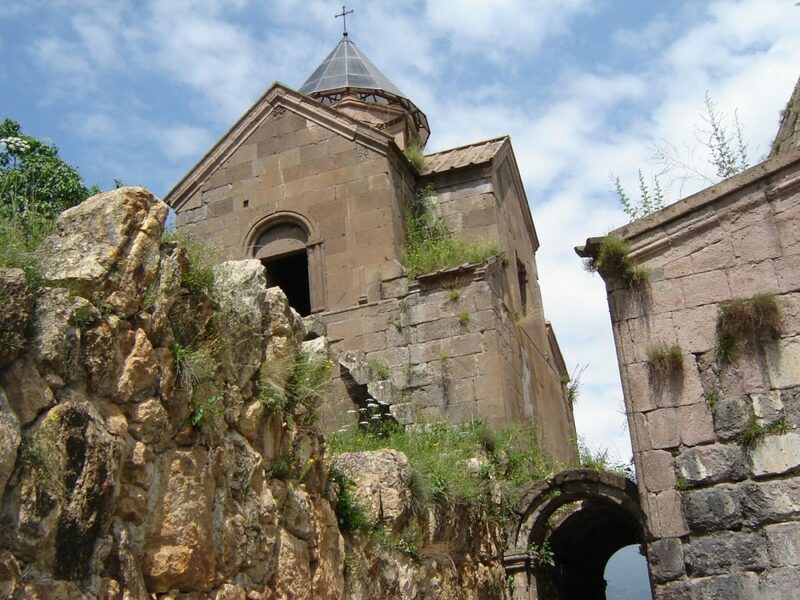 The monastery was founded by Mkhitar Gosh who was a famous spiritual scholar, fable-writer and jurist. 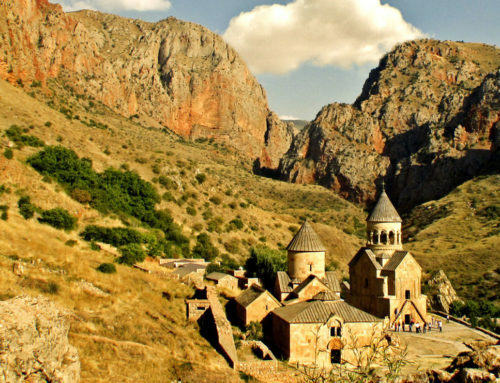 The monastery was erected in the place of Old Getik Monastery which was completely destroyed as a result of the earthquake of 1186. 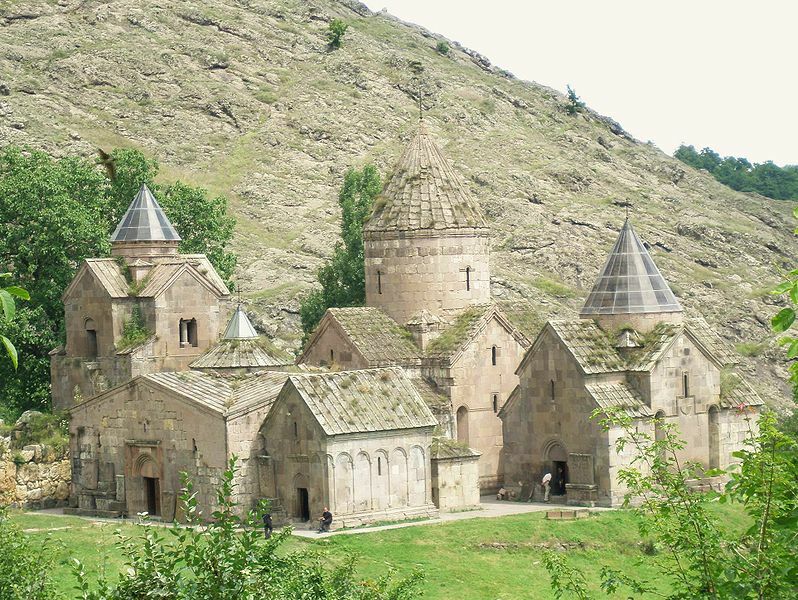 The construction of the monastery started at the end of XII c. and came to its end in about one hundred years. That’s why it is more unified by the architecture of the monuments included in it. 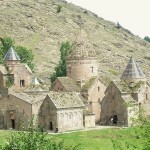 It was initially called New Getik Monastery, afterwards it inherited the name of its founder and was called Goshavank. 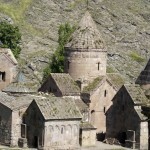 Goshavank was one of the famous centers of medieval spiritual culture and manuscript-writing. In the seminary working here were taught the following disciplines: law, history, philosophy as well as arts (architecture, miniature-painting, music, calligraphy). The spiritual figures who had studied here (Vanakan Vardapet, Kirakos Gandzaketsi and others), continuing the traditions of their school, later established spiritual schools in other places. 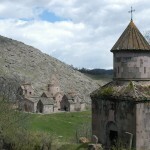 While Mkhitar Gosh was an abbot, here were erected two small churches (St. Lusavorich, built of wood, and St. Hovhannes-Karapet). Neither of the churches has survived. 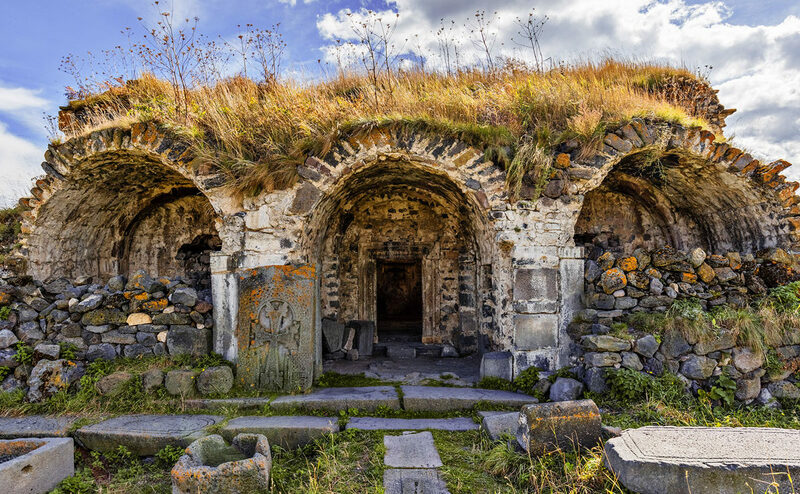 St. Astvatsatsin Church with its narthex is also here. 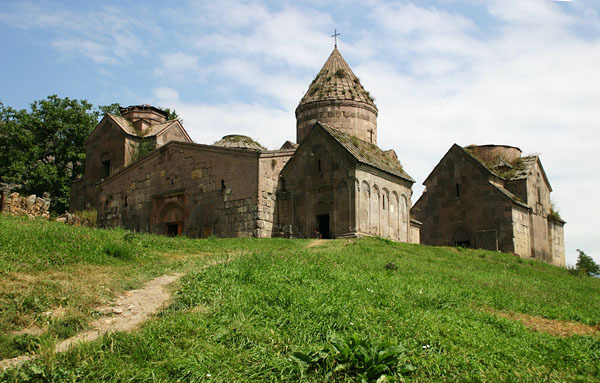 The construction of the monastery continued till the end of the XIII c.
The monuments comprising a part of the architectural complex of New Getik are divided into two groups. On the northern slope of the small ravine is located the principal group. 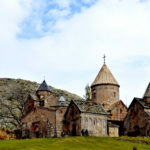 It consists of St. Astvatsatsin, St. Lusavorich, St Grigor Churches, of a fore-church, library-belfry, another civic construction, chapels, cross-stones placed on pedestals. To the south-east of this group, on the opposite slope of the small ravine, a little bit higher from each other are located St. Hripsime two-apsidal church and a ruined building which is considered the burial place of Mkhitar Gosh. 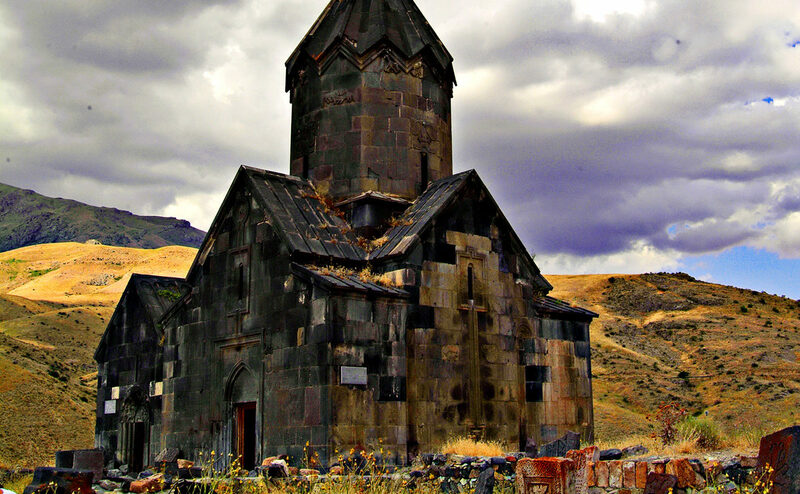 St. Astvatsatsin Church — is the first construction of the monastic complex, built in 1191–1196. 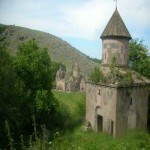 The church was erected by master Mkhitar Hyusn, by the support of Kurd and Khacheni Vakhtang Princes. 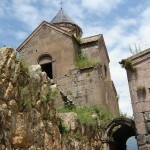 The construction belongs to the type of cross-domed churches, with a pair of double-storeyed sacristies adjacent to the main apse and with a pair of triangular niches in the southern and eastern walls. The entrance is from the main narthex, the other is in the northern façade. The exterior architecture is plain. The western portal and the ornamented belt-course, passing along the upper part of the massive drum and crowning the spatial structure, make up the architectural-artistic emphasis. 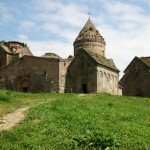 Fore-church (from the west)—was constructed immediately after the building of the main church, in 1197–1203, with the support of Zakare and Ivane brothers. It belongs to the type of four-pillared fore-churches, with a pair of vestries in the eastern corners. The eight pilasters adjacent to the walls, besides the four pillars, serve as a support for the system of the overhead cover. The central section is crowned with a garret-window. The exterior and interior walls lack adornment. St. Grigor Church — was built in 1241, at the southern side of the main church and has smaller dimensions. 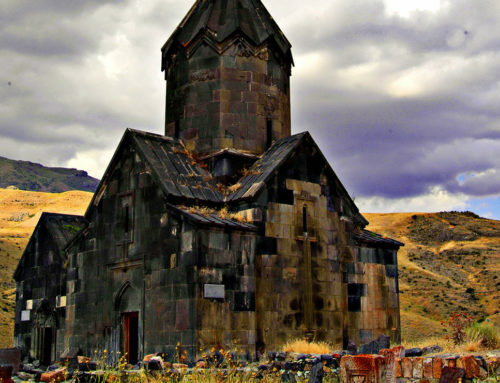 St. Lusavorich — is the third church of Goshavank, erected in 1237–1241. 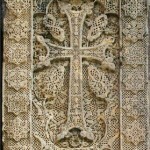 It is adjacent to the southern wall of the fore-church and was constructed by the means of Prince Grigor Tgha who also sponsored the construction of St. Grigor Church. This graceful church belongs to the type of one-nave basilica which could be met rarely in those times. 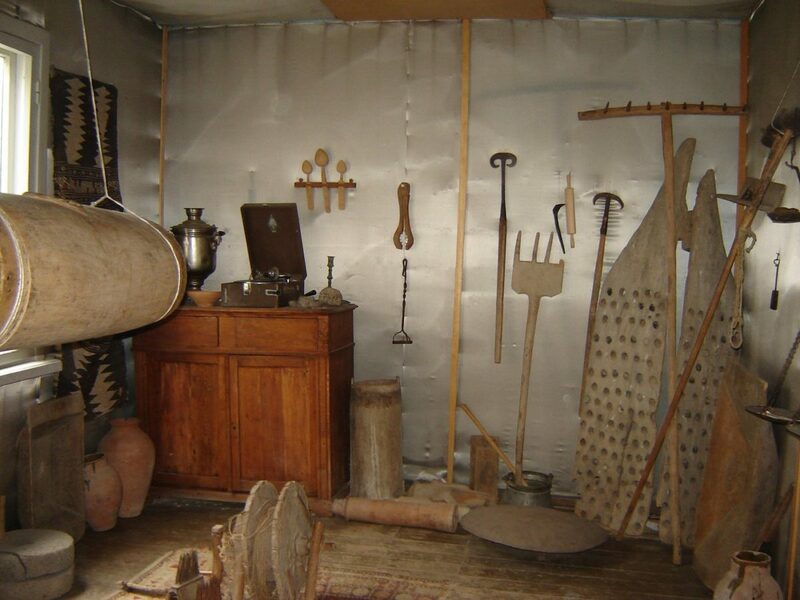 It had a vaulted overhead cover, included under a gable roof. 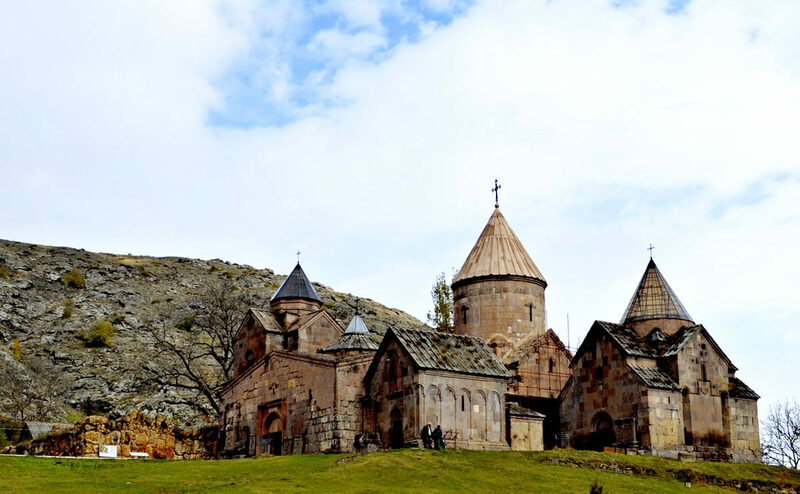 It differs from the other churches of the monastery by the exceptional decorativeness of the exterior walls, by refined ornaments and architectural elements. 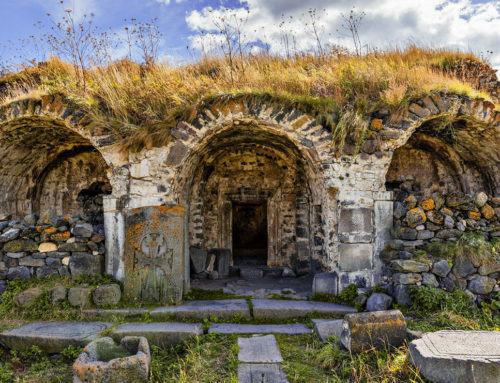 The solution of the western wall with a beautiful portal, with the blind arcades of the walls and transitory semi-arches (as those of the church of Deghdzut Monastery) and with rich forms of the window of the eastern wall is especially noteworthy. Library-belfry — this two-storeyed construction is a noteworthy monument from the architectural viewpoint. The library of the construction was built in 1241and the belfry — in 1291. The library section is like the library of Haghpat Monastery. In the construction having a square plan the opposite interior walls are connected with one another by solid arches leaning on a pair of low pylons. The arches, crossing with one another in the upper part of the inner space, bear the overhead cover of the library and its superstructure-belfry. There are niches in the interior walls of the library for keeping manuscripts. 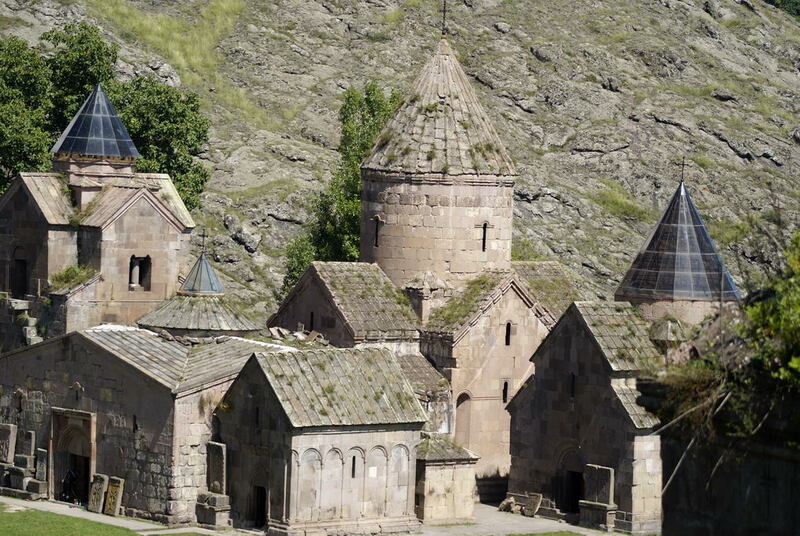 The belfry added on the library totally harmonizes with the existing basement and they together served as a base for double-storeyed church-crypts (St. Astvatsatsin of Eghvard, Burtelashen of Amaghu Noravank, Kaputan) for the formation of the planning and volumetric-spatial structure. The structure of the central part of its overhead cover is of certain interest. The passage to the polygonal wide garret-window is realized with the help of stone beams put aslant. The beams in their middle parts have three-leaved grooves (as for esthetic considerations, also for the purpose of dispersing the upper light at a wider angle). 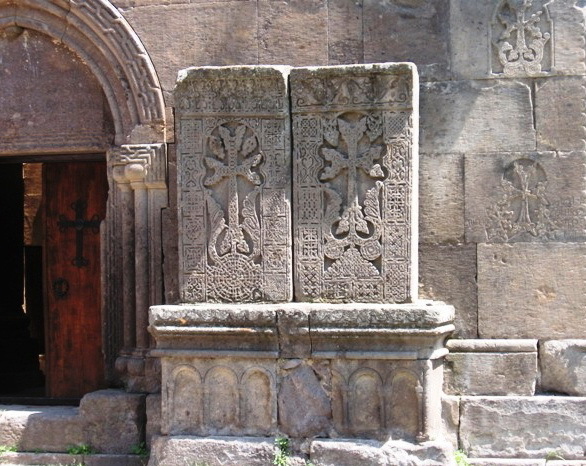 The treasures of the monument are the cross-stones placed on pedestals, on both sides of the entrance of St. Lusavorich Church, created by gifted master-sculptor Poghos (Pavghos), in 1291. 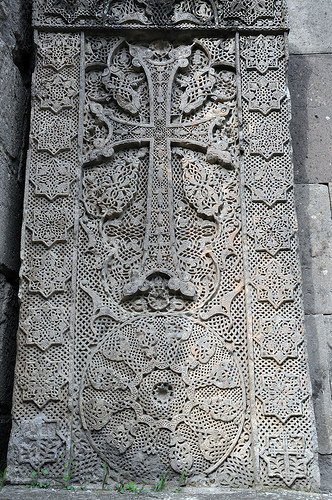 The cross-stones are ornamented with intricate elegance and that’s why they are figuratively called “embroidered”. 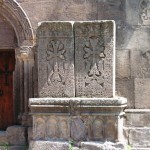 Such a cross-stone has been placed on the right side of the entrance of St. Spirit Chapel. 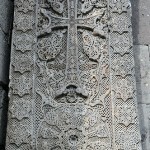 Those cross-stones, being the best examples of Armenian cross-stones and masterpieces of medieval Armenian ornamentation art became widely-known and were highly valued. At the north-western side of the building of the library-belfry was located a wooden-roofed construction. From the latter only the walls have survived. Supposedly, it was the dining-hall or the school of the monastic order. 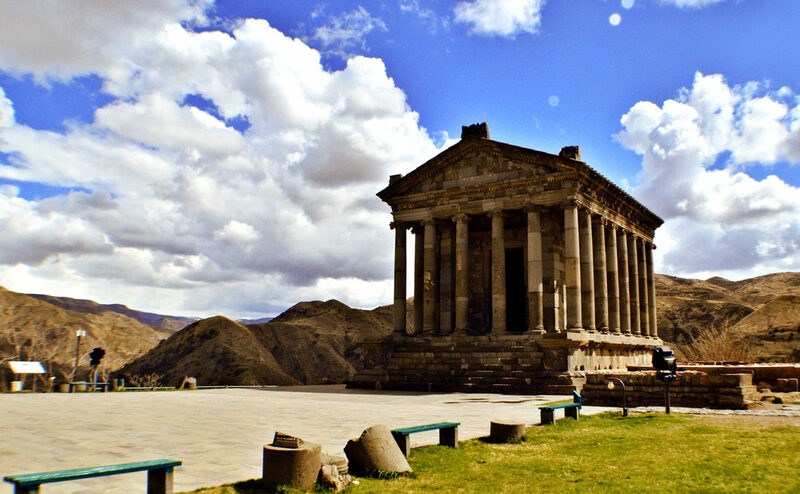 The monuments group was repaired in 1950-1960th (authors: H. Gasparyan, Yu. Tamanyan). 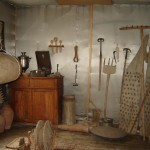 There is a small working exhibition attached to the monastic complex. 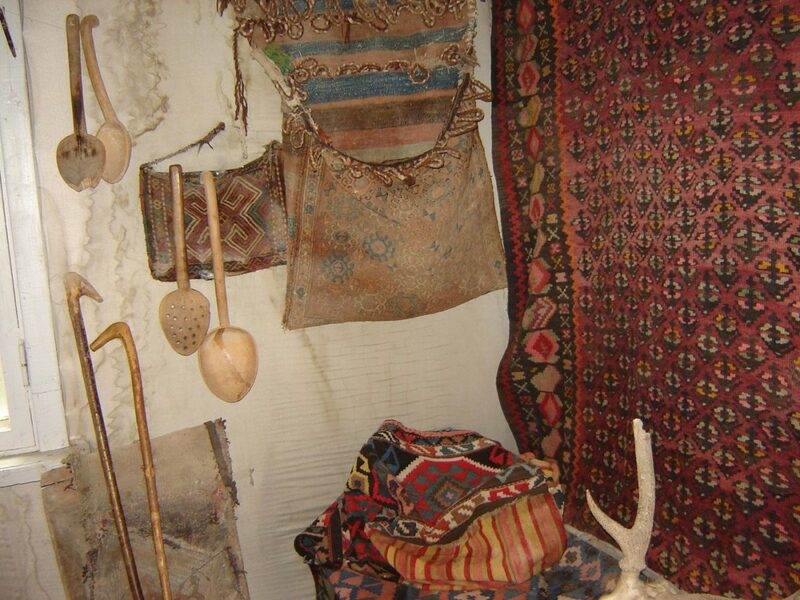 Here are presented about 100 materials of ethnographical character. 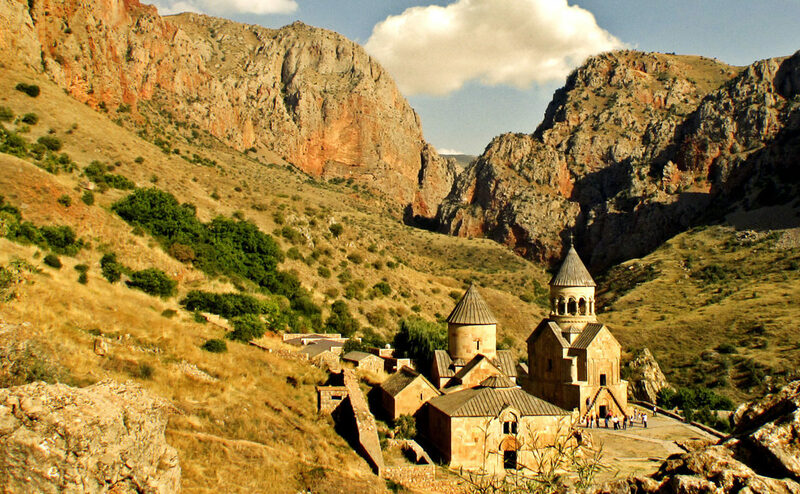 By decision N 616 (July 9 of 2001) of the Government of Armenia, it was granted to Mother See of Holy Ejmiatsin. Tamanyan Yu., Azatyan Sh., Goshavank: Measurements and Photographs, Yerevan, 1974. 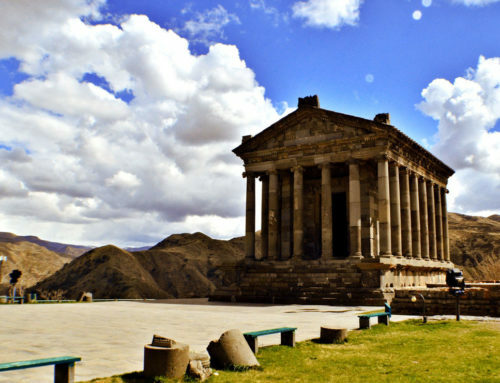 Harutyunyan V., History of Armenian Architecture, Yerevan, 1992. Khalpakhchyan O., The Architectural Ensembles of Armenia, Moscow, 1980, /in Rus./. Goshavank, Milano, 1974 (Documenti di architettura Armena, N 7).